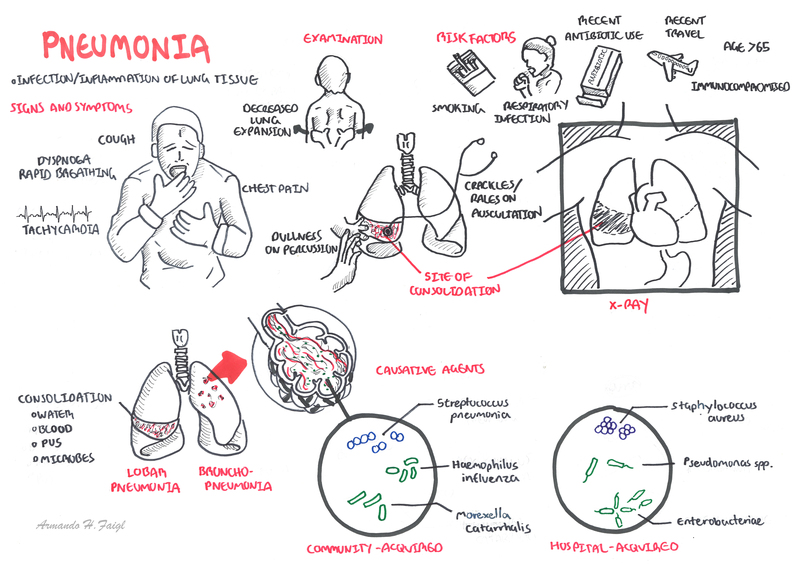 Summary of Pneumonia Pneumonia involves symptoms and sign of lower respiratory tract infections usually associated with chest x-ray abnormalities (consolidation). The majority of causes is bacterial (80%). Finding on examination may show signs of consolation. Risk factors include smoking, young and old age and having an underlying respiratory disease. Treatment is antibiotic therapy. 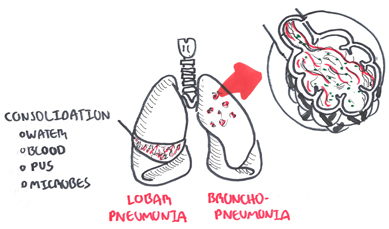 Overview Types of pneumonia include lobar pneumonia (infection affects a whole lobe of a lung) and bronchopneumonia (affects the bronchioles through out a lung lobe). 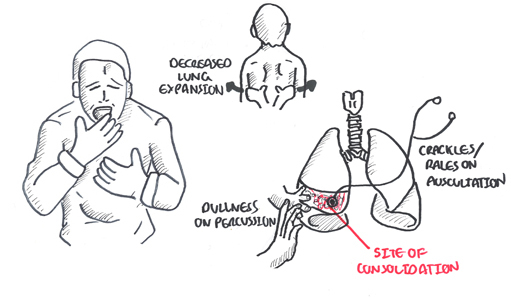 The infection is identified by the site of consolidation. Consolidation is where the lung tissue is filled with fluid (ie. 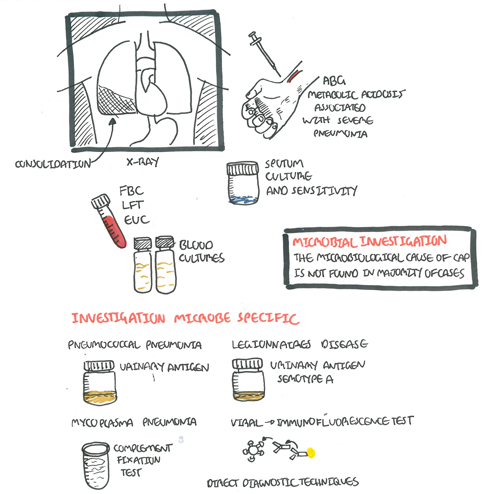 water, blood, pus, microbes). Risk Factors for pneumonia include smoking, recent travel/antibiotics use, age and being immunocompromised. 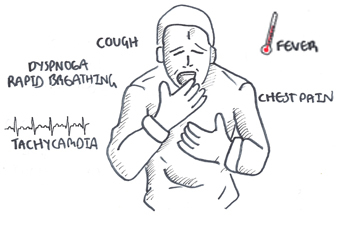 Cardinal symptoms: Cough (productive), Dyspnoea, Pleuritic chest pain, Fever. S. pneumoniae H. influenzae S. aureus M. pneumoniae M. catarrhalis Gram – Enterobacteriae Klebsiella spp. Legionalla spp. Management depends on where the pneumonia was acquired and what the causative agent is or might be. The standard is antibiotic therapy. However again, antibiotic therapy will depend on the most likely bacteria, patient co-morbidities, allergies and antibiotic resistance. Some patients with mild illness, good social circumstances and no significant co-morbidities may be safely discharges with appropriate antibiotics, simple analgesia for pleuritic chest pain. Follow up with doctors. For patients with a high severity score (CURB-65 or SMART-COP or PSI index) admission to hospital is advised.